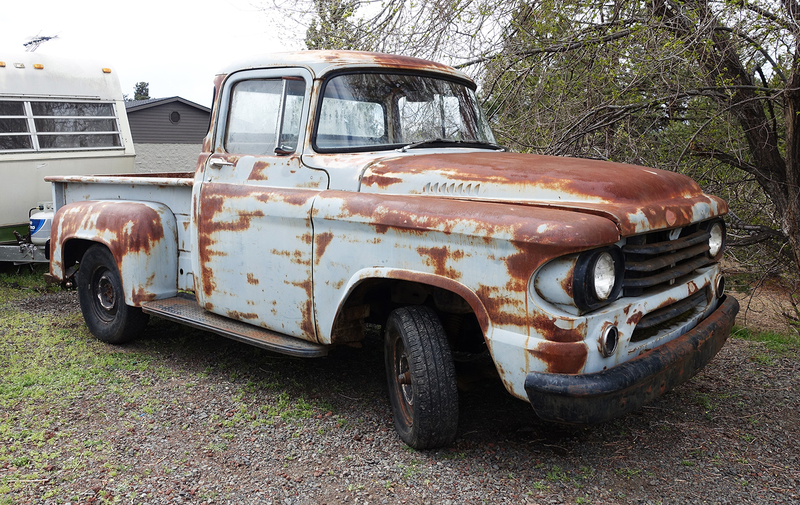 Well, we are in the home stretch on the 1958 Dodge D100. Glass is in, interior is done. We had a last minute engine swap, after discovering that the motor we put in was a bit worn out. Bed is done. Painted bits are on. Drive train is installed. Now it’s time to make a spare tire bracket, back bumper, mirrors, bright work install, and a few minor details before getting a logo painted on the doors. It has been a while since I gave a little progress update on the D100 pickup. 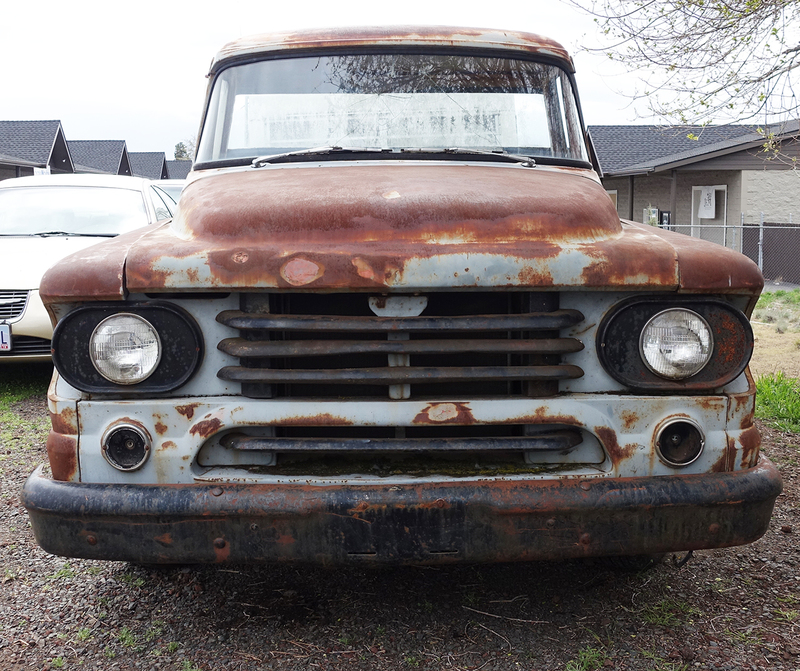 Last year we bought an old industrial building, so the funds to make the Dodge D100 project move along were challenging. The boys over at VR Garage have been steadfast and patient, getting things done as I can get money their way. I have expressed how concerning it was having someone else do the restoration, as it is the first project i haven’t done myself, but I am getting a bit excited as we get closer to completion. Like any restoration, it has cost twice as much and taken twice as long as planned, but I keep adding projects and changing my mind, so it is to be expected. So far we have dropped in a refurbished Chevy 350 small block and added an automatic transmission. All wiring is new. New gauges and surrounds. Disc brakes with new wheels and whitewalls. New and adjusted suspension. New steering column. New tail lights. Replaced the radiator and refurbished the gas tank. We still have left the interior, a new bed, clear coating the patina finish, painting some detail pieces, lettering on the door. Exhaust. Back bumper. All new glass and seals. And I am sure a hundred more things I am forgetting. But, it should be on the road by summer, as the building remodel is nearing its end and I can concentrate again on finishing up the truck. Today was the day I picked up the old beast. I used a hay trailer without a winch and thank goodness my friend, Fatty, had sense to remind me to pick up a couple of chains and come-alongs to help us load it. We stopped and bought some heavy duty straps as well. It was a bit of a challenge getting it on the trailer once we got there. The kind seller of the truck ended up hooking his modern truck to a chain on the bumper of the Dodge D-100 and we dragged it up on the trailer, nearly dumping it off the side. If it hadn’t been for his help I would have had to leave and return with another trailer that had a winch. The truck was in pretty good condition. No serious rust or corrosion. A few minor dents and dings. Brakes not functioning. No steering wheel. In need of new windows and rubber seals. In need of new tires. Electrical looks shot. Never been started. damaged door (which is why he had 2 extra doors included in the sale). But great patina. 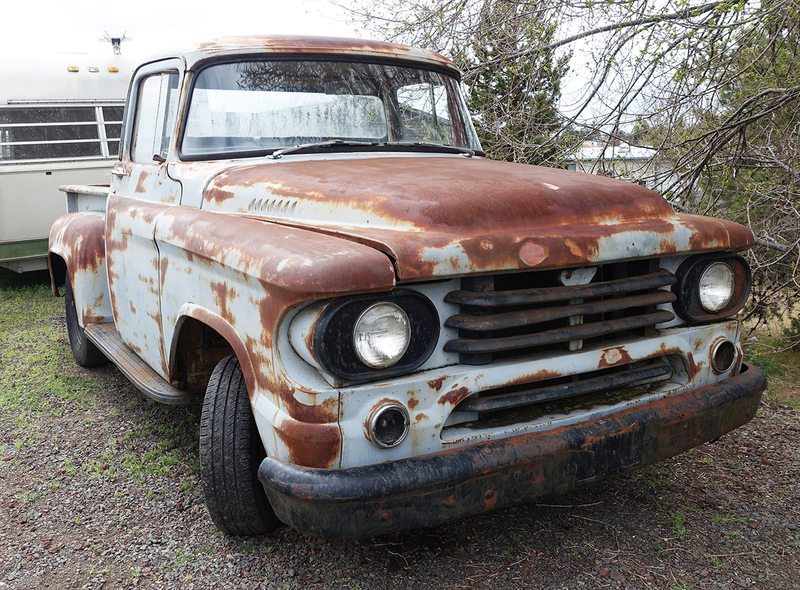 I immediately towed it over to the Auto Clinic of Bend. Julius and his daughter, JulieAnn, are classic rat-rod specialists. Turns out JulieAnn had been after this truck for quite some time, even stopping and knocking on the door of the owner, who was not home when they knocked. So far 3 people I have talked to had been trying to get this truck. Again, the stars seemed to line up on this for me. Getting it off the trailer took the assistance of the good guys at the Vintage Rollers Car Club. We all got behind it and pushed and shoved and gently let the brakeless monster off the trailer and onto the lot using a lock wrench on the steering wheel column to muscle it into place.